34) What so special about this ceiling? 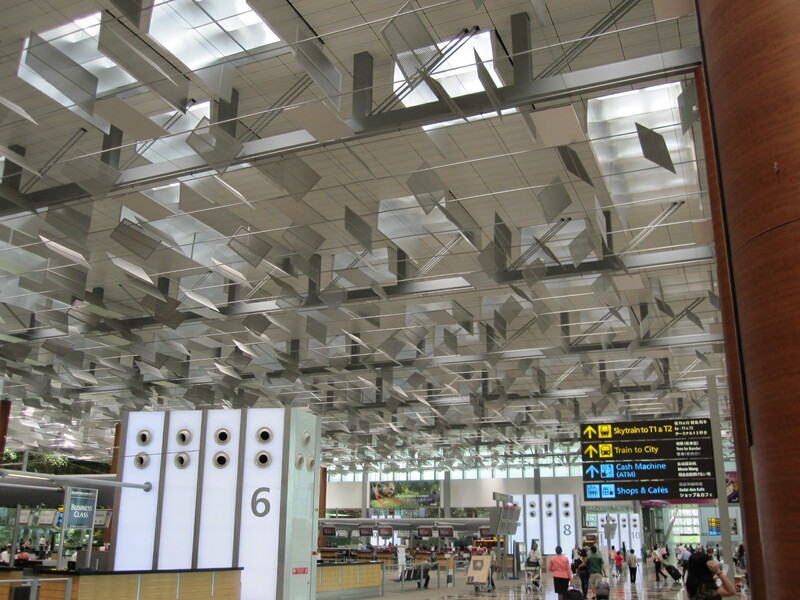 This is the main reflective roof ceiling of Singapore Changi Airport Terminal 3. This unique roof has a second name – “butterfly roof”. As the name has it, the butterfly-like automatic reflector panels open up its wings and reflect natural light from the open skylight and illuminate the open space beneath. 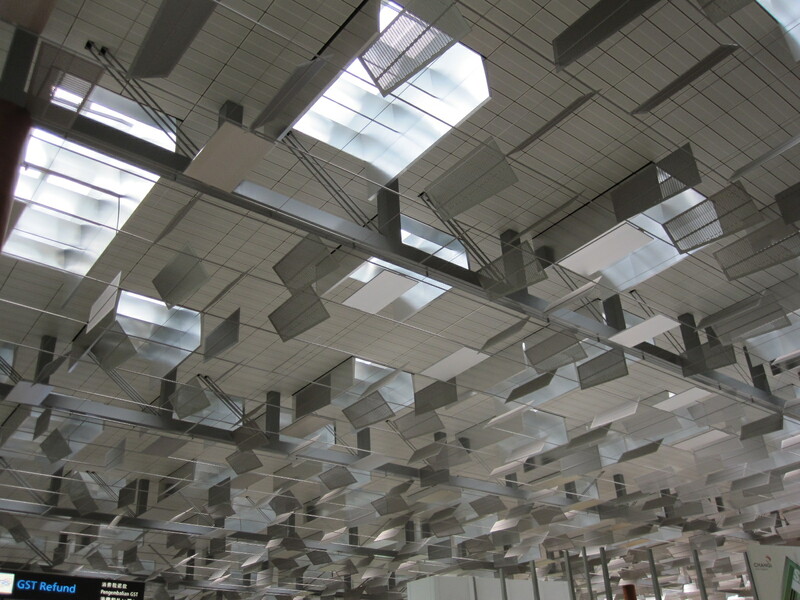 The daylighting system helps to reduce energy usage by minimizing daytime use of artificial lightings. It also results in decreased cooling load for air-conditioning. During the night, the skylights will be lighted up by artificial lightings, and the reflectors will do the same job as in the day as an Eco-Ambassador. 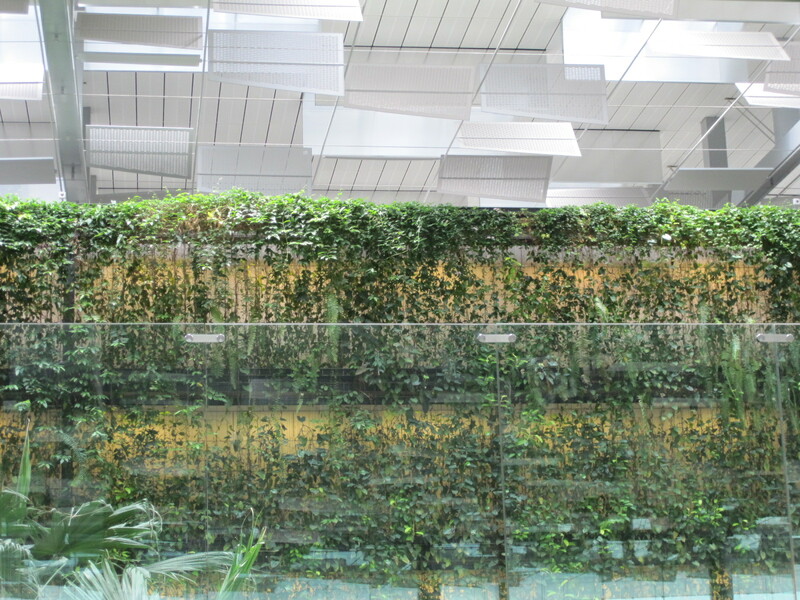 Beneath the impressive roof, a distinctive 15m high vertical garden call The Green Wall, spanning 300m across the building enjoys and dances in the light of glory. When you look up the ceiling, you see a group of eco designers spreading their warm gestures and friendly handshakes. That is where I salute them with the great job they have done to conserve energy and our environment. This entry was posted in Singapore Spot a Spot / 点出景点 and tagged Arts, life, literature, nature, photography, postaday, Singapore, tourist spot in singapore. 35) Where is your Bandstand? It’s great and ingenious… very practical indeed! yes! is Eco friendly, and thanks for stopping by Sandra,cheers! You’re welcome Sydney, your blog is just superb! Magnificent and so intriguing. Really beautiful. What an unusual sight. I wonder how many people notice as the go to/ arrive from their plane? that is true! we always take things for granted, but on the other hand how many people look up ahead instead of the air ticket and the plane? LOL! cheers Mary! Sometime it worth to look up to see the ceiling! also beware of the traffic! LOL! cheers, my yellowcable! Very interesting and educational to me. Thanks for a great post! Oh, Butterfly Ceiling, what a lovely name. We like it. 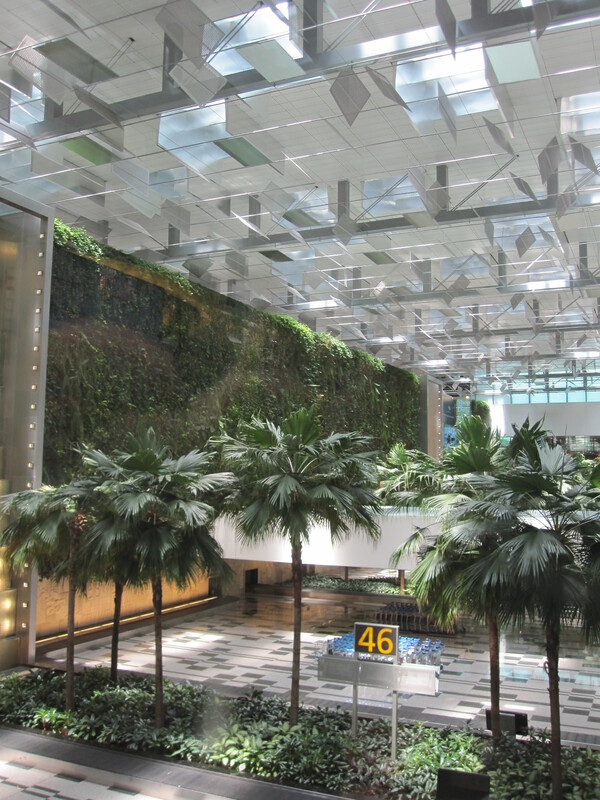 Actually we were pretty fasinated by the airport ceilings, such as the one in Jakarta and we got photos too. Nice pictures. I am sure we have many fascinating stuffs in the world, is up to us to see with our own eyes! thanks midnightvisitor! is come with a pair! LOL! thanks Charron! oops, spell your name wrongly! see you Rexlin! Ingenious design, and very Singaporean in that it is goal-orientated. Beautiful! I will share this with my Eco-conscious friends. This is one airport I have yet to experience. Have not been to Singapore, Sydney. Very nice…on my next trip to Asia in the Spring, I hope to be able to visit Singapore for a couple of days and see this architectural element of the airport. okay! but don’t leave your luggage behind! LOL! see you then! They did an awesome job indeed! Not only is it eco-friendly but it’s so creative and beautiful! Not many people concern about the ceiling specially a check-in and out place which full of joy and season greetings. thanks for your visiting! That’s so cool! Will check this the next time I use Terminal 3. 6 JUN 2014 MAAD Pyjamas 2014. 4) Sydney is out for party throw again! 4) Shall we go for a stroll? 8) Why I want to break free? DO YOU SEE WHAT I'M TALKING ABOUT? There's a hip grandparent in all of us! Good feels and lofty ideals. So many things to say, so little time! "Learning to Live with Fritz"
If all else fails, play dead! A journey to Great Gatsby in the 21st century. Finding fun in simple ways makes the happiest days.